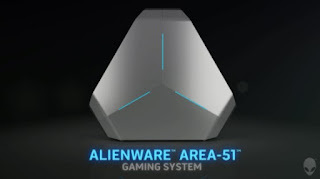 The presence of Intel Core X-series processors and the X299 chipset on the market has recently been greeted with a fresh breeze by many, including a classmate of Dell who reportedly recently updated its latest flagship premium gaming desktop computer line, Alienware Area 51, with the support of ammunition the Intel product. Dell’s true breakthrough to carry the support of chipset X299 on Area 51 was first coined in June ago amid many world’s leading computer manufacturers are still wait and see. 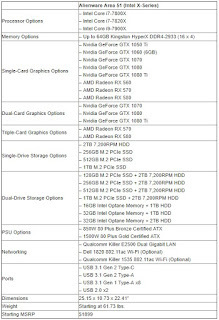 This is very reasonable considering at that time Intel X299 chipset and Threadripper has not been released so that everything related to the full specifications and configuration options the product looks still impressed vague. 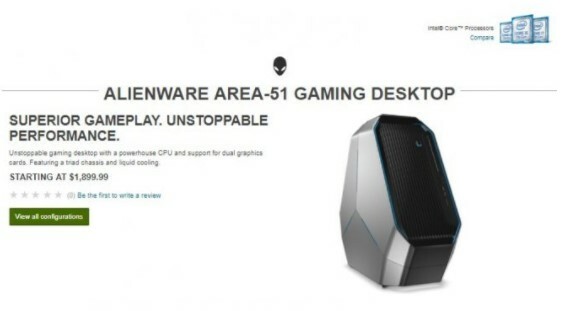 After delivering Threadripper support, it’s time now Dell arming its flagship Alienware Area 51 product with Intel’s top-tier support. 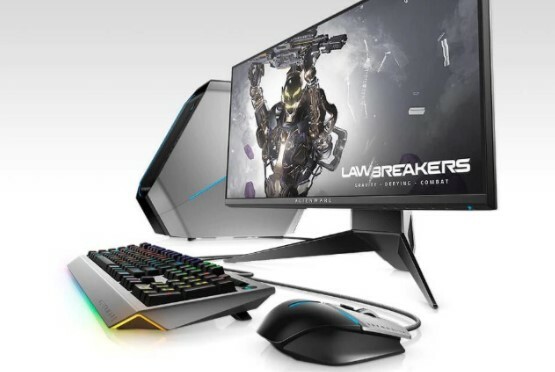 Featuring Intel Core X-series processor support, this Dell Alienware Area 51 can be armed using a Core i7-7800X, i7-7820X or i9-7900X processor, with a standard liquid cooling as a high-performance CPU. The X299 motherboard has an unlocked BIOS that can be overclocked, and the platform can be loaded with a Kingston HDR4-2933 kit with a capacity of up to 64GB in the presence of four DDR4 UDIMM slots. 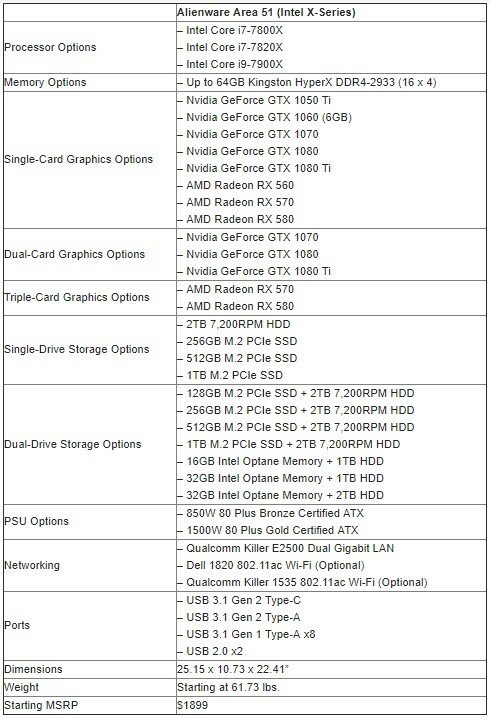 Graphical options are available on both sides of the aisle, with Nvidia graphics card options ranging from GeForce GTX 1050 Ti to GTX 1080 Ti, while for AMD Radeon’s own graphics options come from the top three GPU RX 500 series models, such as the RX 560, 570, and 580. Double graphics card configuration is available with GTX 1070, 1080, and 1080 Ti GPUs, and triple graphics card installation offered with Radeon RX 570s or RX 580s. The new Alienware Area 51 with Intel X-series processor support takes advantage of existing storage options. The configuration options of the drives featuring capacity 2TB 7200RPM hard drive or M.2 PCIe SSD with a capacity of 256GB, 512GB, or 1TB, while the dual-drivenya configuration options consist of hard drive capacity of 2TB and M.2 PCIe SSD 128GB, 256GB, 512GB, or 1TB. In addition, the Intel memory Optane also available in 16GB and 32GB capacities, with a choice of 1TB and 2TB HDD. By presenting the operation of the maximum, Dell has packed a lot of power to the new Area 51 with options ranging from 850W power supply and drive up to 1500W. Support was also abundant connectivity in the new Area 51, thanks to eight USB 3.0 ports (two in front, six in back) and two USB 3.1 ports Gen 2 (one Type-A, one Type-C). Dual gigabit LAN is provided by Qualcomm Killer E2500 NIC, and wireless connectivity is available in the form of Killer 1535 or Dell 1820 802.11ac WiFi.